MRS Energy & Sustainability publishes reviews on key topics in materials research and development as they relate to energy and sustainability.Topics of energy and sustainability to be reviewed are new R&D of both established and new areas; interdisciplinary systems integration; and objective application of economic, sociological and governmental models, enabling research and technological developments.The reviews are set in an integrated context of scientific, technological and sociological complexities relating to energy, the environment and sustainability.The intended readership is a broad spectrum of scientists, academics, policy makers and industry professionals, all interested in the interdisciplinary nature of the science, technology and policy aspects of energy and sustainability. 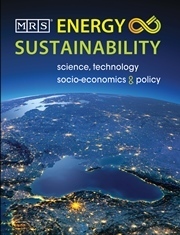 To purchase print-on-demand copies of MRS Energy and Sustainability, please follow this link. Purchase of print-on-demand copies is handled and fulfilled directly through Sheridan Custom Publishing*.